To present 12 gynecologic cancer cases with brain metastasis and a discussion of the relevant literature. Gynecologic malignancy is the second most common cancer in elderly women, following breast cancer. These cancers usually spread locally at first, and common distant metastatic sites are the lungs, liver, spleen, and distant lymph nodes. The brain is not a usual site of metastatic involvement. Materials and methods: The study included 12 cases with various gynecologic malignancies that were retrospectively analyzed. Therapeutic modalities, survival, and time between initial surgery and brain metastasis were recorded. Results: The mean survival was 41.4 months in 6 patients with ovarian cancer versus 27.7 months in those with other gynecological cancers. At the time of brain metastasis, the CA-125 level was elevated in all of the patients, except one that had cervical cancer. The mean CA-125 level was 202 IU mL-1. There were no differences in the mean overall survival between the patients that underwent surgical resection and those that received medical treatment. Conclusion: Brain metastasis can occur in all gynecologic cancers and has a poor prognosis, despite multimodal treatment. Graf AH, Buchberger W, Langmayr H, Schmid KW. Site preference of metastatic tumours of the brain. Virchows Arch A Pathol Anat 1988; 412: 493-8. 2. DeAngelis LM. Managment of brain metastasis. Cancer Invest 1994; 12: 156-65. 3.
serous ovarian carcinoma. Gynecol Oncol 1993; 51: 171-4. 4.
unusual event. Gynecol Oncol 1993; 49: 37-40. Pectasides D, Aravantinos G, Fountzilas G, Kalofonos C, Efstathiou E, Karina M et al. Brain metastases from epithelial ovarian cancer. Th e Hellenic Cooperative Oncology Group (HeCOG) experience and review of the literature. Anticancer Res 2005; 25: 3553-8. Cohen ZR, Suki D, Weinberg JS, Marmor E, Lang FF, Gershenson DM et al. Brain metastases in patients with ovarian carcinoma: prognostic factors and outcomes. J Neurooncol 2004; 66: 313-25. 7. Geiser JP, Geiser HE. Brain metastases in epithelial ovarian carcinoma. Gynecol Oncol 1995; 57: 246-9. Eltabbakh GH, Piver MS, Werness BA. Primer peritoneal adenocarcinoma metastatic to brain. Gynecol Oncol 1997; 66: 160-3. Nalesnik SW, Kost ER, Hines JF, Hall KL. Solitary brain metastasis indicating recurrent primary peritoneal carcinoma. Obstet Gynecol 1999; 93: 844. Cormio G, Lissoni A, Losa G, Zanetta G, Pellegrino A, Mangioni C. Brain metastases from endometrial carcinoma. Gynecol Oncol 1996; 61: 40-3. Orru S, Lay G, Dessi M, Murtas R, Deidda MA, Amichetti M. Brain metastases from endometrial carcinoma: report of three cases and review of the literature. Tumori 2007; 93: 112-7. Dursun P, Ayhan A, Tarhan NC, Coban G, Kuscu E. Cerebellar metastasis in squamous cell vulvar carcinoma. Arch Gynecol Obstet 2009; 279: 69-71. Vazques JP, Cobo SL, Anton PM, Asado AC, Vidart JA, Coronado P et al. Brain metastasis and carcinomatous meningitis from vulvar squamous cell carcinoma: case report. Eur J Gynaecol Oncol 2007; 28: 154-8. Lassman AB, DeAngelis LM. Brain metastases. Neurol Clin 2003; 21: 1-23. Barker GH, Orledge J, Wiltshaw E. Involvement of the central nervous system in patients with ovarian carcinoma. Br J Obstet Gynaecol 1981; 88: 690-4. Yang JX, Shen K, Shan Y, Lang JH, Wu M, Guo LN et al. Seven cases of epithelial ovarian carcinoma with brain metastasis. Chinese Medical Sciences Journal 2008; 23: 19-22. Lesser GJ. Chemotherapy of cerebral metastases from solid tumors. Neurosurg Clin N Am 1996; 7: 527-36. Larson DM, Copeland LJ, Mose RP, Malone JM Jr, Gershenson DM, Wharton JT. Central nervous system metastases in epithelial ovarian carcinoma. Obstet Gynecol 1986; 68: 746-50. Smith SC, Koh WJ. Palliative radiation therapy for gynaecological malignancies. Best Pract Res Clin Obstet Gynaecol 2001; 15: 265-78. Wen PY, Black PM, Loeffl er JS. Treatment of metastatic brain cancer. In: Devita VT Jr, Hellman S, Rosenberg SA, editors. Principles and practice of oncology. 6th ed. Philadelphia: Lippincott Williams and Wilkins; 2001. p.2655-70. Tay SK, Rajesh H. Brain metastases from epithelial ovarian cancer. Int J Gynecol Cancer 2005; 15: 824-9. Chen YL, Cheng WF, Hsieh CY, Chen CA. Brain metastasis as a late manifestation of ovarian carcinoma. Eur J Cancer Care 2011; 20: 44-9. Amita M, Sudeep G, Rekha W, Yogesh K, Hermant T. Brain metastasis from cervical carcinoma – a case report. Med Gen Med 2005; 14: 7-26. Mahmoud-Ahmed AS, Suh JH, Barnett GH. Tumor distribution and survival in six patients with brain metastases from cervical carcinoma. Gynecol Oncol 2001; 81: 196-99. Buckner J. Surgery, radiation therapy, and chemotherapy for metastatic tumors to the brain. Curr Opin Oncol 1992; 4: 518- 24. Patchell RA, Tibbs PA, Walsh JW, Dempsey RJ, Maruyama Y, Kryscio RJ et al. A randomized trial of surgery in the treatment of single metastases to the brain. N Engl J Med 1990; 322: 494- 500. Gien LT, Kwon JS, D’Souza DP, Radwan JS, Hammond JA, Sugimoto AK et al. Brain metastases from endometrial carcinoma: a retrospective study. Gynecol Oncol 2004; 93: 524- 8. Monaco E 3rd, Kondziolka D, Mongia S, Niranjan A, Flickinger JC, Lunsford LD. Management of brain metastases from ovarian and endometrial carcinoma with stereotactic radiosurgery. Cancer 2008; 113: 2610-4. Aalders JC, Abeler V, Kolstand P. Recurrent adenocarcinoma of the endometrium: a clinical and histopathological study of 379 patients. Gynecol Oncol 1984; 17: 85-103. Wronski M, Zakowski M, Arbit E, Hoskins WJ, Galicich JH. Endometrial cancer metastasis to brain: report of two cases and a review of the literature. Surg Neurol 1993; 39: 355-9. Ruelle A, Zuccarello M, Andrioli G. Brain metastasis from endometrial carcinoma: report of two cases. Neurosurg Rev 1994; 17: 83-7. Sewak S, Muggia FM, Zagzag D. Endometrial carcinoma with cerebellar metastasis: a case report and review of the literature. J Neurooncol 2002; 58: 137-40. Mariani A, Webb MJ, Keeney GL. Hematogenous dissemination in corpus cancer. Gynecol Oncol 2001; 80: 223-8. Chura JC, Marushin R, Boyd A, Ghebre R, Geller MA, Argenta PA. Multimodal therapy improves survival in patients with CNS metastasis from uterine cancers: a retrospective analysis and literature review. Gynecol Oncol 2007; 107: 79-85. Mahmoud-Ahmed AS, Suh JH, Barnett GH, Webster KD, Belinson JL, Kennedy AW. Th e eff ect of radiation therapy on brain metastases from endometrial carcinoma: a retrospective study. Gynecol Oncol 2001; 83: 30-9. N’Kanza AL, Jobanputra S, Farmer P, Lovecchio J, Yelon JA, Rudloff U. Central nervous system involvement from malignant mixed Müllerian tumor (MMMT) of the uterus. Arch Gynecol Obstet 2005; 273: 63-8. Wong L, Seen HT, Khootan HS, Low JS, Ng WT, Low JJ. Combined adjuvant cisplatin and ifosfamide chemotherapy and radiotherapy for malignant mixed müllerian tumors of the uterus. Int J Gynecol Cancer 2006; 16: 1364-9. Kim JK, Lee SK, Myong HN, Kang YD. Biopsy-proven cerebellar metastasis from a malignant mixed mullerian tumor (MMMT) of the uterus. Eur J Gynaecol Oncol 2009; 30: 196-8. Cormio G, Pellegrino A, Landoni F, Regallo M, Zanetta G, Colombo A et al. Brain metastases from cervical carcinoma. Tumori 1996; 82: 394-6. Ikeda S, Yamada T, Katsumata N, Hida K, Tanemura K, Tsunematu R et al. Cerebral metastasis in patients with uterine cervical cancer. Jpn J Clin Oncol 1998; 28: 27-30. Chura JC, Shukla K, Argenta PA. Brain metastasis from cervical carcinoma. Int J Gynecol Cancer 2007; 17: 141-6. Ratner ES, Toy E, O’Malley DM, McAlpine J, Rutherford TJ, Azodi M et al. Brain metastases in epithelial ovarian and primary peritoneal carcinoma. Int J Gynecol Cancer 2009; 19: 856-9. ISNAD CÖMERT, Esra ÇABUK , BİLDACI, Tevfik Berk , KARAKAYA, Burcu KISA , TARHAN, Nefise Çağla , ÖZEN, Özlem , GÜLŞEN, Salih , DURSUN, Polat , AYHAN, Ali . "Outcomes in 12 gynecologic cancer patients with brain metastasis: a single center&#8217;s experience". 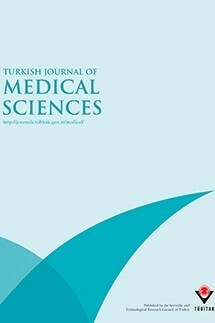 Turkish Journal of Medical Sciences 42 / 3 (March 2012): 385-394.